Through MEA’s new Smart Energy Communities Program and a previous USEPA grant, the small town of Edmonston, Maryland proudly continues to make tremendous strides towards a sustainable future. 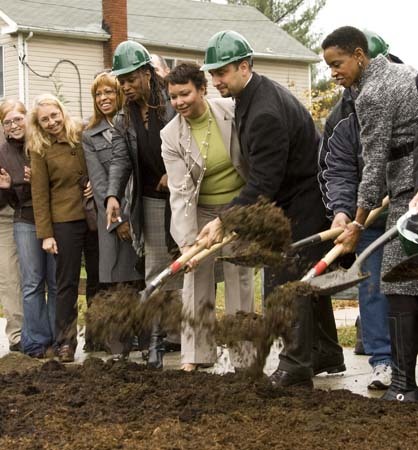 In 2009, work began to transform Edmonston’s main residential street, Decatur Street, into a one of the greenest streets in the region. Completed in 2010 and featuring energy efficient LED street lights powered by clean wind energy, bike lanes, and storm water catching rain gardens, the street is now the pride of the community. “All towns and cities have to replace their streets at some time – so why not ensure it in completed in the most responsible and environmentally sustainable way?” Mayor Adam Ortiz explained at Decatur Street’s dedication ceremony. The Maryland Department of the Environment’s Smart, Green and Growing Program recognized Edmonston’s efforts the year after the innovative street was finished by presenting it with the 2011 Sustainable Infrastructure and Innovation in Stormwater Management Award. Soon after this achievement, Edmonston completed an energy audit for their Town Hall. As a result of the audit findings the town upgraded florescent light bulbs to cost-saving energy efficient bulbs, added solar panel installations to the roof, and continued their stormwater management improvements by installing a rain garden in front of the Town Hall. In order to improve stormwater management even more, the town added bio-retention ponds throughout the community. Finally, the town added more bike lanes with a recent street paving. These lanes now allow biking enthusiasts to connect to the Anacostia River Bike Trail System. The Smart Energy Communities Program offers grant funding to local governments for energy-related projects. Once a local government passes certain policies and energy reduction plans related to energy efficiency, renewable energy, and/or transportation petroleum reduction goals, the entity can apply for grant funding to complete their energy reduction ambitions. As a Maryland Smart Energy Community, Edmonston currently focuses its efforts on energy efficiency and renewable energy and the town is in the process of constructing a new maintenance facility to include internal energy efficient LED light bulbs and geothermal technology. Additional projects may include the installation of HVAC systems, energy efficient street lights, and energy efficiency upgrades for low income residents. A greener future is indeed ahead for this Smart Energy Community.